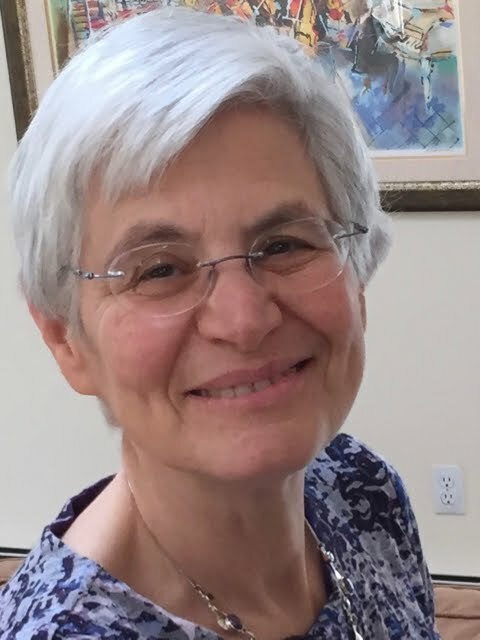 Kudos to Judith Graham of Kaiser Health News for yet again identifying a new development that has the potential to enormously affect the medical care of older people. Her article, “Geriatric Assessments Could Fine Tune Cancer Care for Older Adults,” pointed me to the American Society of Clinical Oncology's (ASCO) new guidelines for the management of patients over age 65 with cancer. The headline (and I know that journalists don’t generally write the headlines for their articles) is the only part of the article that’s misleading: the changes suggested would not merely “fine tune” oncologic care for older people, they would radically transform it. Here’s the situation: 70 percent of cancer patients are over age 65 and that number will rise in the next 20 years. Looked at differently, the risk of developing cancer at some point if you are a man over age 70 is one in three, and the risk for women is one in four. Despite the predominance of older cancer patients, most clinical trials of chemotherapy drugs include few if any older people: they have too many other problems to meet the eligibility criteria for participating in the study. But those same people, with all their other medical problems and functional impairments, are regularly given chemotherapy, based on the results of studies that didn’t involve anyone like them. That’s a problem. What we do know is that 50 percent of older patients with advanced cancer experience severe toxicity from chemotherapy in the first three months of treatment. We also know that the Institute of Medicine’s recent study, “Delivering High Quality Cancer Care," found that the current delivery system is “ill-equipped to address the needs of older patients.” Oncologists agree with this assessment, stating that “the care of older adults with cancer needs to be improved” and putting the responsibility on themselves. Specifically, only one quarter or less of oncologists felt confident in their ability to recognize dementia, identify a fall risk, or assess functional status. And we know from a recent study that patients shift their priorities from sheer survival to quality of life as functional status declines. In light of these observations, what does ASCO recommend? 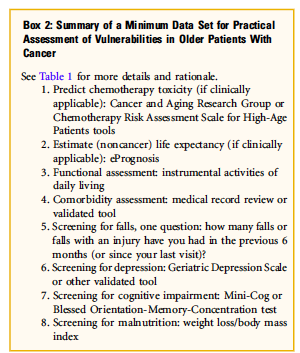 The new guideline, “Practical Assessment and Management of Vulnerability in Older Patients Receiving Chemotherapy,” makes a series of evidence-based suggestions. From the perspective of patients and their families, what’s important to know is that oncologists who are contemplating administering chemotherapy to people over age 65 should provide a geriatric assessment to identify problems they might not otherwise recognize. Specifically, they should take simple steps to look for falls, to determine how well patients can function day to day, to identify all other medical diagnoses besides the cancer that might impact treatment, to screen for depression, to evaluate cognition and nutrition, and to assess the social support system. Because the guideline is meant to be practical, it suggests specific tools that oncologists can use to achieve these ends. The guideline also advocates determining the approximate life expectancy, both the cancer life expectancy and the non-cancer life expectancy. But there’s another potential outcome, one that perhaps paradoxically undermines the accuracy of the predictive tools on which the recommendations rely. There is the possibility that performing a geriatric assessment will lead to implementing the recommendations of that assessment with resultant improved capacity to withstand the rigors of chemotherapy. The authors of the guideline recognize this possibility. They say, “While there are not yet completed RCTs [randomized controlled trials] that demonstrate that GA-guided care, or ‘GA with management,’ definitely improves outcomes of older patients with cancer, this care model has been shown to improve outcomes in older noncancer populations.” Randomized controlled trials are reportedly ongoing to evaluate the ability of “GA-guided care” to actually improve outcomes in older cancer patients—not merely to modify their willingness to undergo chemotherapy in the first place, but also their longevity and quality of life if they do accept chemotherapy. The first step is for patients and caregivers to request and oncologists to perform geriatric assessment. The second step is to act on the findings of the assessment. That doesn’t just mean using the information to guide decision-making about cancer treatment; it means, first and foremost, making some changes that will optimize the patient’s overall condition. These changes might include physical therapy, modification of the non-cancer medical regimen, or providing more social support. It might be necessary to delay instituting chemotherapy, and delay talking about whether to start chemo until certain basic interventions have taken place. One analogy that may be helpful is rehab. When a patient and family are struggling to decide if it’s going to be possible to return home after a debilitating hospitalization, it’s often helpful to begin with a stay at a rehab facility. The goal is to optimize the patient’s condition before making important decisions about where to live. A second analogy is depression. Depression may color a patient’s decisions about preferences for care. 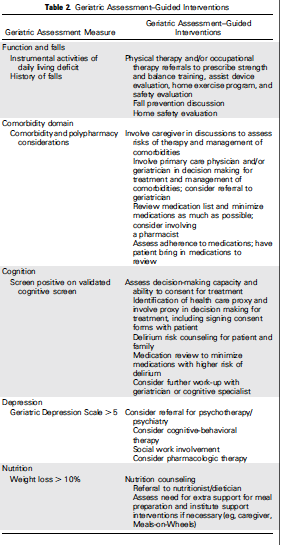 In general, whenever feasible, it’s desirable to treat depression before accepting a patient’s views about, say, limiting care for some other medical condition, as representing his or her true wishes. So, by all means, let’s do geriatric assessments on older patients with cancer. How, exactly, that will shape care remains to be determined.